4th match of Carlton Mid Tri-Series has been played between Australia and England at Bellerive Oval, Hobart today. England put huge score of 303 runs with IR Bell's superb 141 runs but, Australia skipper SPD Smith in debut match as captain made 102* runs for australia and lifted possible win from England in 49.5 overs. Smith declared man of the match for his brave inning of 102* runs. Earlier, Australia won the toss and decided to field first. England putting into bat first, started inning with MM Ali and IR Bell. Both played good cricket and added 113 runs for 1st wicket before MM Ali got out scoring 46 runs. JWA Taylor joined with IR Bell but, lost wicket early scoring just 5 runs. JE Root came in middle and played good inning of 69 runs. Opening batsman IR Played splendid inning of 141 runs of 125 balls and put huge score of 303 runs at the enf of 50 overs for Australia. Following hune target of 304 runs, Australia got good start with AJ Finch and SE Marsh. Both added 76 runs before Finch got out contributing 32 runs. SPD Smith joined with Marsh and played good inning of 42 runs of 40 balls. SE MArsh also lost his wicket scoring 45 runs. Middle oredr batsman GJ Maxwell made 37 runs before got out. SPD Smith and JP Faulkner played useful inning for Australia in middle overs. JP Faulkner made 35 runs and BJ Haddin added useful 42 runs of just 29 balls before got out. 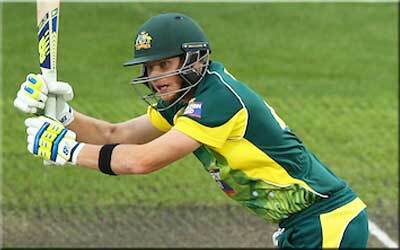 Skipper SPD Smith stood in middle till and gave Australia remarkable win by 3 wickets. He made important 102* runs. Australia registered win in 49.5 overs in heart beating game.